McLaren knew from early on in the Malaysian Grand Prix weekend that it was going to be difficult to beat Ferrari on pace, and Lewis Hamilton's quickest lap on Friday afternoon was not representative of the comparative speed of the two cars on long runs. The important thing as far as the race was concerned was to secure the second row and not have a BMW or other unwelcome interloper in the way, and initially, McLaren did just that. 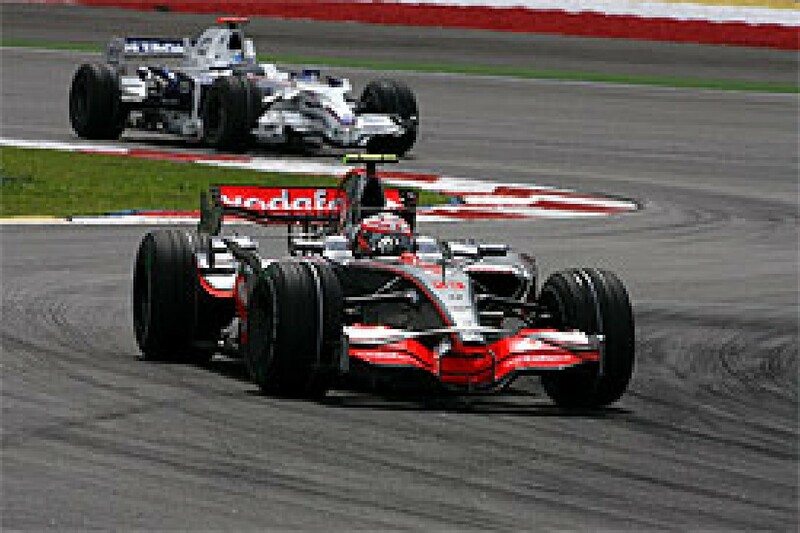 The surprise, certainly to the team, was that Heikki Kovalainen was also ahead. In only his second race alongside Hamilton, he made a point by out-qualifying the Briton, and did it with an extra lap's worth of fuel in the tank, as the race was to demonstrate. Hamilton admitted he had a bad Saturday, and things just did not come together for him, especially when it mattered on the soft tyre. "We're still on the second row, we still have the opportunity to at least get some good points," he said straight after the session. "Tomorrow we will push hard at the beginning of the race, but it's very tough on the tyres, and it may rain. It would be nice if it was a wet race tomorrow. "I just didn't have enough grip really, and I was losing quite a lot of time in the second and the last sector. I would say it's more of a problem in qualifying. This morning (in practice) was quite good, we had very good fuel loads, and I think the pace is quite good. Maybe the strategies are a little bit different, but I think Ferrari did a good job." Hamilton was right to question the strategies, for Ferrari duo Kimi Raikkonen and Felipe Massa were to stop one and two laps before the Briton respectively, but that didn't fully account for the difference. At that stage, Hamilton made no mention of the storm that was already brewing in the paddock. Everyone saw BMW's Nick Heidfeld and Renault's Fernando Alonso weave their way through a queue of slow moving cars while on their fast laps, an extraordinary sight that had no precedent. It was clear that at the very least they had both suffered an unnecessary distraction, but closer inspection on replay showed that both McLarens had been in an unfortunate position on the track. Alonso was never going to do anything but stir the pot as far as a McLaren infringement was concerned, while Heidfeld in particular had every right to be angry. It would emerge in the race that he was BMW's 'hare', fuelled a not-insignificant four laps lighter than teammate Robert Kubica. It was no surprise that the stewards soon took action, and called in the two McLaren drivers, although several hours passed (and a messy, wet GP2 Asia race didn't help) before the decision was announced. It was easy for cynics to regard any slip as a chance for the authorities to make life a little harder for McLaren, but this really was a self-inflicted wound, and it should not be overlooked that Toyota's Timo Glock suffered a five-place penalty in Australia for an offence that even Red Bull's Mark Webber - the man held up - did not seem too fussed about. My first thought was that the team - rather than the drivers themselves - were more culpable, and had not informed Heikki and Lewis that quick cars were still coming. McLaren F1 CEO Martin Whitmarsh insists they did inform the drivers, but whether or not McLaren were as fast as Ferrari in relaying the information, or even BMW (with Kubica), is a moot point. "We did inform that drivers were on quick laps," Whitmarsh says. "But it's a team mistake, because everything's a team mistake, as we are a team, and we don't want to ascribe it. But both drivers were told on the radio that there were guys on fast laps. "You can complain about the regulations (which we were a part of), you can complain about the circumstances, the reality is we shouldn't get a situation that encourages drivers to be on track at the same time with closing speeds of over 200km/h, which the current regulations encourage you to do. "We were unfortunate because of the threat of rain, which caused the majority to go early, and two cars to effectively be out of phase. If it wasn't for that, it wouldn't have arisen. And we were unfortunate that six cars got on the same straight to go to the same corner, and four of them were slow, and two of them were trying to do their quick laps." "I think the drivers had to make a quick decision. Imagine you're told that, you look in the mirrors, you know that there's a BMW coming, then you see a BMW on the right hand side, and you've got to make a decision - is that BMW going the same speed as me, or is that the BMW that's going fast? "It is inherently pretty dangerous to cross the track, unless you're absolutely sure, with those sorts of closing speeds. They made a call, rightly or wrongly they felt it was safer to stay on the left hand side. "Nick went past them on the straight. He set his fastest sector at that stage, and I'm sure if you look at the data there was no brake pressure and no lift, but on the other hand I sympathise with him. If you're trying to do your fastest lap and you've got cars on both sides of the track like that, it's pretty distracting. I understand their dissatisfaction with it; I understand the decision of the stewards. "Of course, I'd have preferred them to be leaner on both, and I thought they were a little bit harsh on Lewis. But we respect that. I think they've got to send a clear message to the drivers to make sure they understand what they've got to do under those circumstances. "So we were disappointed but not super surprised by the decisions of the stewards. Before it had been announced we had already decided that if that was the outcome, we would not be appealing. We would accept it completely." In fact, it's not possible for a team to appeal against that kind of decision, but that sentiment was a genuine one. The result was that overnight the team had to ponder what to do from eighth and ninth place on the grid, and the first problem was to at least get past Alonso, a man who was not going to do McLaren too many favours. When the tyre blankets came off before the start, we saw an unusually diverse spread of choices, with the front row Ferraris, third-placed Kubica and sixth-placed Mark Webber on the harder tyres, and everyone else (bar Force India's Adrian Sutil) on the medium. In the first corner confusion, Webber was able to jump up to fourth so that in the early laps the four cars running strongly at the front were all on the harder tyre. That may just have been a co-incidence, but it certainly gave Hamilton and McLaren food for thought as they watched events unfold. Lewis at least salvaged much of the advantage lost with the penalty by getting past his teammate, Alonso, Heidfeld and Toyota's Jarno Trulli - all of whom tripped over each other in the first corner. Fifth at the end of the lap was a useful gain, but until lap 16 he was stuck behind Webber, and could not really use any performance that the softer tyre might have given him. 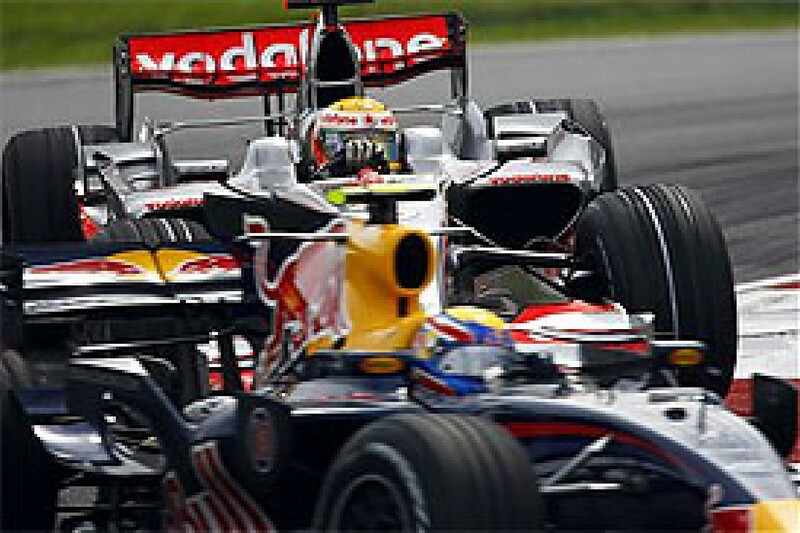 Webber pitted on lap 16, and Lewis had three laps on his own to guarantee that he came out ahead of the Australian. 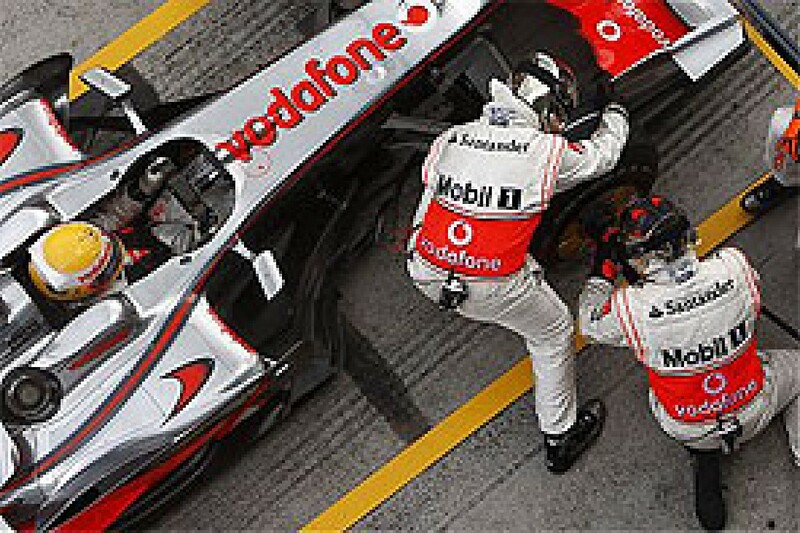 However, it all went wrong in the pits - with the mechanics seen struggling to fit one of Hamilton's tyres - and the McLaren man was lucky to escape with a loss of 10 seconds. "What happened was the guy went on it with the gun and was gunning it, but the wheelnut didn't come off," says Whitmarsh. "He then pulled the gun off and switched to the other gun, which had a hub cab fitted to it. He had to get that removed, which is not an easy job. It's preloaded, because the biggest fault in practice has effectively been the loss of a wheelnut/hub cab - as you take the gun off it fires off - and you reach for another gun, preloaded with another one, and put it on. "So he then removed that spare hubcap, he gunned it with the second gun, and then the nut came off. The initial reaction during the race was that the first gun wasn't generating enough force to get the nut off. Our current understanding is that the problem occurred on the car with the wheelnut locking mechanism. When the plunger was pushed in by the gun, it didn't retract the pin. So the gun was required to shear the pin. Fortunately the second gun did shear it, and he got the nut off. "It could have been worse, but the wheel locking mechanism was designed so that you can shear the pin. It was designed just to hold the nut on, and not against that force. So in theory there is enough force to unlock the nut and if necessary shear those pins, which the second one did." Instead of coming out in what was effectively fourth, well clear of Webber and with Kubica at least in his sights, Hamilton lost out to Kovalainen, Trulli and the Red Bull man, and was down in seventh with a lot of work to do. It was never going to be easy, and indeed, he seemed to be struggling a little, even in the opening stint. "He was sliding around," says Whitmarsh. "An analysis could be that we made a mistake with the preferred tyre, because he was as it turned out better and more fluid and more comfortable on the prime [in the third stint]. And that is an analysis that may well prove to be founded. More probable is that Lewis believed that the option was a more consistent race tyre, but he didn't get clear air. "It's often the case at Sepang that if you qualify well, run at the front, get clear air, you don't damage your tyres, they don't go away from you, and you have that performance. I think with the prime tyre was the only time he had clear air, whereas with the option he was damaging the tyres, sliding, locking, which you tend to do when you're following someone all the way through. "Unfortunately he had traffic through the first stint. His stop would have got him into clear air with the second set of tyres, but because of that 10 seconds, it dropped him behind Mark Webber. His second set of tyres he locked up, flat-spotted and in fact delaminated the tyres - they were quite badly damaged. So trying to judge the relative performance of the prime and option is I think potentially misleading on the face of it. "We haven't done the analysis, and I'm very willing to accept that we may have made a mistake, but that was the judgement that we took. It's difficult now to analyse it, because all the time that he was fitted with what we believe was the preferred tyre, the option tyre, he was behind people and sliding and locking." Hamilton had another handicap. I was watching the race on the inside of the first corner, and in the middle stint it became apparent that the front right hubcap (i.e. where the wheel nut had stuck) had a mind of its own. The hubcap slot or opening is located at around the 5 o'clock position in normal running, but the car was now arriving at the end of the straight with it in the diagonally opposite position of 11 o'clock. Under braking - and then under acceleration through to Turn 2 - it would then pivot forward and swing back and forth like a pendulum. On some laps the hubcap would start spinning completely around in the direction of wheel travel, creating a rather bizarre effect. Neither Whitmarsh nor Lewis was aware of that behaviour until I described it to them after the race, and clearly there must have been some cooling and efficiency implications. Hamilton put on a good charge in that final stint and certainly kept TV viewers entertained, but while he closed the gap to Trulli, he was never in a position to pass. Both men were also reeled in by Heidfeld. A few weeks ago no one would have imagined that McLaren would be racing either with BMW or Toyota, even allowing for the penalty putting the silver cars out of position. Nevertheless, Kovalainen's third and Hamilton's fifth provided a valuable haul of points, and Massa's retirement - self-induced or otherwise - was a useful bonus. But there was no escaping the performance differential to the red cars. "The negatives frankly were that Ferrari looked quick, and we underperformed," concludes Whitmarsh. "We didn't quite get to where we wanted to be with balance and set-up, and once you do that, you're starting to damage the tyres and it gets away from you. We were disappointed by what happened in qualifying but accept entirely what the stewards did, but it was just unfortunate circumstances that led us to that. And then we were disappointed by what happened at the pitstop. "On the plus side, I think towards the end of the race Lewis was quick, and was able to demonstrate that the performance gap isn't as large as it might have looked at other parts of the race." The one real encouragement the team could draw from the race was the performance of the man that outsiders at least have hitherto perceived as Hamilton's number two. He's already proved that he's far more than that. "Heikki in his second race really did a flawless job. 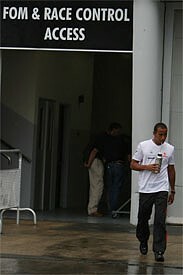 As you saw he was heavier than Lewis in qualifying, and yet quicker, so he and his guys did a good job to get to there. He made no mistakes and was flawless, he should have been second again. In fact he should be leading the world championship if he had a bit more luck, because he should have been second in both races. "The thing that is really positive is that, when all is said and done, we are still leaving the second race leading both world championships. I wouldn't say it was a shabby start to the year, but it's maybe not quite what we hoped would have happened." Perhaps Whitmarsh should not take too much heart from Hamilton's performance in the third stint, because it should not be forgotten that unlike the McLarens, Raikkonen had to save his engine for Bahrain, and was miles ahead by that stage. Don't forget, too, that Ferrari tested at Sakhir in February, and that has to convey some kind of advantage for the next race. McLaren chief Ron Dennis has always said that Spain is where it really starts - the team's supporters must hope that he's right.